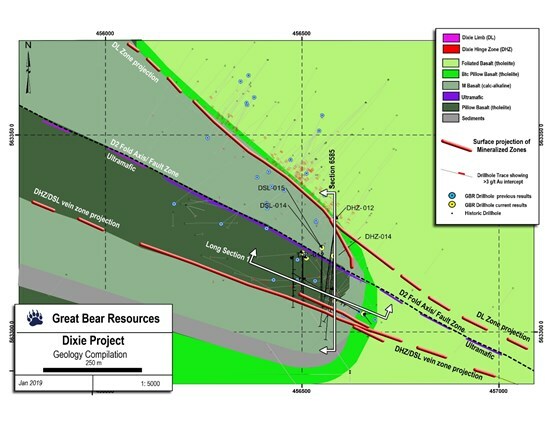 Great Bear Resources (TSX-V: GBR) today reported drill results from the Hinge Zone and South Limb Zone at its 100% owned Dixie Project in the Red Lake District of Ontario. Results include 1,602.73 g/t gold over 0.70 metres (approximate true width) at 150 metres vertical depth. An image of the gold mineralization in DHZ-014 is shown in Figure 1. Hinge zone hole DHZ-014 intersected a 10.1 metre wide vein zone (approximate true width). Visible gold was observed at both its upper and lower contacts (Table 1). 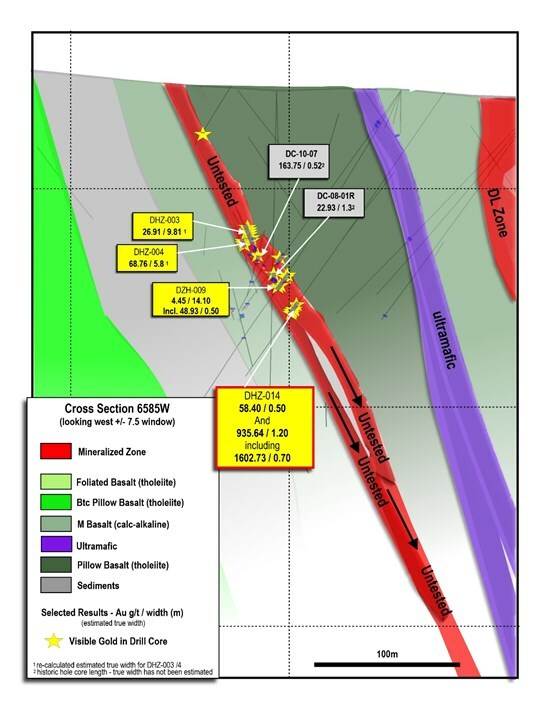 The vein zone is part of the larger Hinge/South Limb vein system, which parallels an ultramafic unit and deep-seated fault at the centre of the Dixie gold system (Figure 2). The DSL/DHZ vein system has been intersected in 28 drill holes across 300 metres of strike length to-date and is open along strike and at depth. 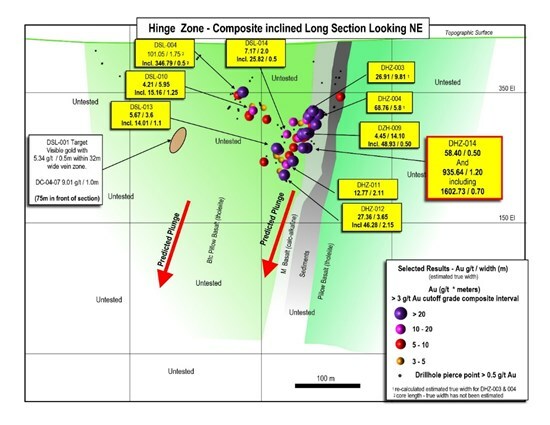 The D2 fold axis that appears to be a significant gold control has been traced through geophysical methods across more than 10 kilometres of strike length. DHZ-014 was drilled to test Great Bear’s 3D vein model, which accurately predicted veining would be present within 15 metres of the actual intercept. Drill core is logged and sampled in a secure core storage facility located in Red Lake Ontario. Core samples from the program are cut in half, using a diamond cutting saw, and are sent to Activation Laboratories Ltd. in Ancaster Ontario, and SGS Canada Inc. in Red Lake, Ontario, both of which are accredited mineral analysis laboratories, for analysis. All samples are analysed for gold using standard Fire Assay-AA techniques. Samples returning over 3.0 g/t gold are analysed utilizing standard Fire Assay-Gravimetric methods. Certified gold reference standards, blanks and field duplicates are routinely inserted into the sample stream, as part of Great Bear’s quality control/quality assurance program. 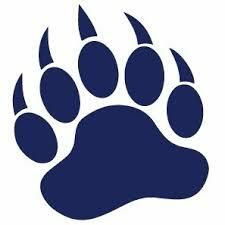 No QAQC issues were noted with the results reported herein.